26 MMS October 2017 mmsonline.com RAPID TRAVERSE Machining Technology in Brief f inis h-mac hining, the se forging a lte r nati ve s promise to compress the front end of the devel- opment cycle, reduce the overall production cost of aerospace structural components and, even- tually, facilitate new part designs that would not be feasible with forging. 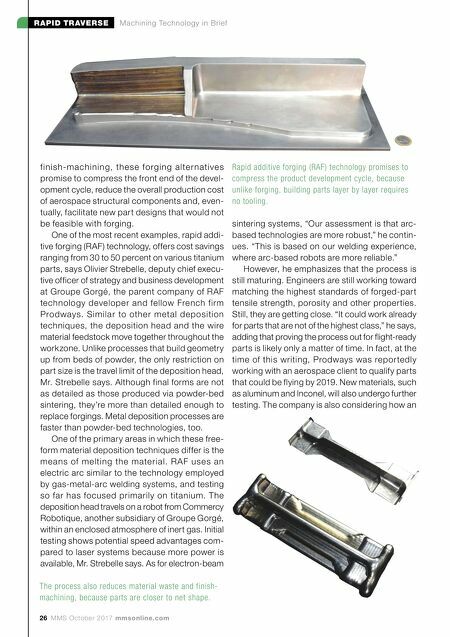 One of the most recent examples, rapid addi- tive forging (RAF) technology, offers cost savings ranging from 30 to 50 percent on various titanium parts, says Olivier Strebelle, deputy chief execu- tive officer of strategy and business development at Groupe Gorgé, the parent company of RAF technology developer and fellow French firm Prodways. Similar to other metal deposition techniques, the deposition head and the wire material feedstock move together throughout the workzone. Unlike processes that build geometry up from beds of powder, the only restriction on part size is the travel limit of the deposition head, Mr. Strebelle says. Although final forms are not as detailed as those produced via powder-bed sintering, they're more than detailed enough to replace forgings. Metal deposition processes are faster than powder-bed technologies, too. One of the primary areas in which these free- form material deposition techniques differ is the means of melting the material. R AF uses an electric arc similar to the technology employed by gas-metal-arc welding systems, and testing so far has focused primarily on titanium. The deposition head travels on a robot from Commercy Robotique, another subsidiary of Groupe Gorgé, within an enclosed atmosphere of inert gas. Initial testing shows potential speed advantages com- pared to laser systems because more power is available, Mr. Strebelle says. As for electron-beam Rapid additive forging (RAF) technology promises to compress the product development cycle, because unlike forging, building parts layer by layer requires no tooling. sintering systems, "Our assessment is that arc- based technologies are more robust," he contin- ues. "This is based on our welding experience, where arc-based robots are more reliable." However, he emphasizes that the process is still maturing. Engineers are still working toward matching the highest standards of forged-part tensile strength, porosity and other properties. Still, they are getting close. "It could work already for parts that are not of the highest class," he says, adding that proving the process out for flight-ready parts is likely only a matter of time. In fact, at the time of this writing, Prodways was repor tedly working with an aerospace client to qualify parts that could be flying by 2019. 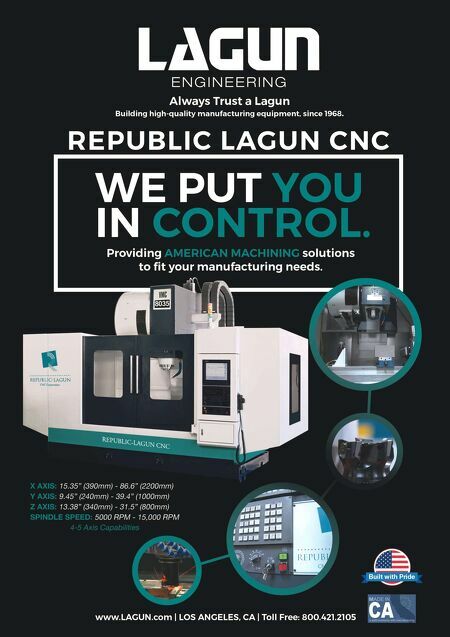 New materials, such as aluminum and Inconel, will also undergo further testing. The company is also considering how an The process also reduces material waste and finish- machining, because parts are closer to net shape.